No, we’re not talking about the ad world’s own Sir Martin Sorrell, although he was in attendance. We’re talking about Richard Gere, Angelina Jolie and Sharon Stone, among others. 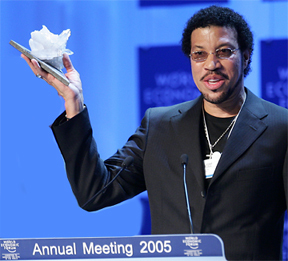 2) Lionel Richie—better known, these days, as the father of Nicole—was in attendance. While we applaud people using their famous names to get causes noticed, it’s dismaying to realize the ultra-serious conference now has a mere two degrees of separation from Paris Hilton.